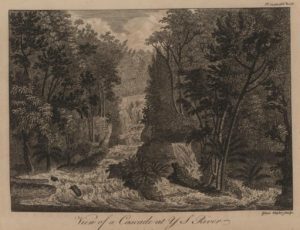 Edward Long, The History of Jamaica or, General Survey of the Antient and Modern State of that Island: with Reflections on its Situation, Settlements, Inhabitants, Climate, Products, Commerce, Laws, and Government volume II, 1774. Image sourced from the John Carter Brown Library. Images from Edward Long's 1774 The History of Jamaica are courtesy of The John Carter Brown Library. First published in London, Edward Long’s 1774 The History of Jamaica [Full title:The History of Jamaica or, General Survey of the Antient and Modern State of that Island: with Reflections on its Situation, Settlements, Inhabitants, Climate, Products, Commerce, Laws, and Government] examines the politics, cultures, and histories of the island. Although born in England, Long spent much of his life on the island overseeing his father's large and lucrative plantation.The text features a number of engravings, done by John Milton of London, including images of the Royal Harbor, the White and YS rivers, Montego Bay, and other locations across Jamaica. In addition to depictions of geographic landmarks, it also features detailed images and descriptions of estates, maps, and plantations. It has been praised for its detailed account of Jamaican geography and is considered a seminal work on the island's histography, and also for what Long's biographer Kenneth Morgan considers a "propaganda" like presentation of Long's opinions as facts. Volumes I, II, and III of Long’s The History of Jamaica are available in our archive. Bryan Edwards, The history, civil and commercial, of the British Colonies in the West Indies volume I, 1794. Image sourced from the John Carter Brown library. Bryan Edwards, The history, civil and commercial, of the British Colonies in the West Indies volume I, 1794. Original image sourced from the John Carter Brown library. 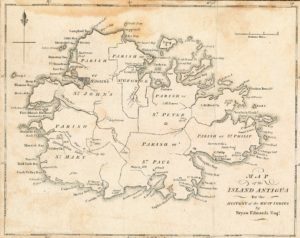 Maps from Bryan Edwards 1794 The History, Civil, and Commercial, of the British Colonies in the West Indies are courtesy of The John Carter Brown Library. Bryan Edwards’s The History, Civil and Commercial, of the British Colonies in the West Indies was first published in 1792 in London and again in Dublin in that same year. Produced in two volumes and split evenly between six books, all consisting of four or five chapters, Edward's provides a scrupulous account of all aspects of trade, slavery, the natural history, and geography of the colonies. The work was popular and well received and was immediately republished in 1794.It would also go on to be an incredibly influential text to all of Edwards contemporaries and an important text to historians as it offered insight into the trades during the turn of the 18th century. It is particularly notable for its maps that are featured here, although it should be noted that they are no longer considered entirely accurate. Edwards’s The History, Civil and Commercial, of the British Colonies in the West Indies can be found in our archive in volumes I and II. Who Were the Natural Historians? How Did Natural History Affect Colonization? Key Text: The Sugar-cane. A poem.